I lived in the Caribbean for almost a decade on 2 different islands and visited many others. Each island is unique, but by observing and speaking to expats (and locals), you notice they all experience a lot of the same challenges and joys. What is it like living in the Caribbean? When you ask yourself this question, you are most likely tired of bad weather or you want a change in lifestyle. There is a lot of variety between the Caribbean islands in terms of size, nature, languages, people, reachability, but also economy. However, the one thing that connects them all is the joy of life. 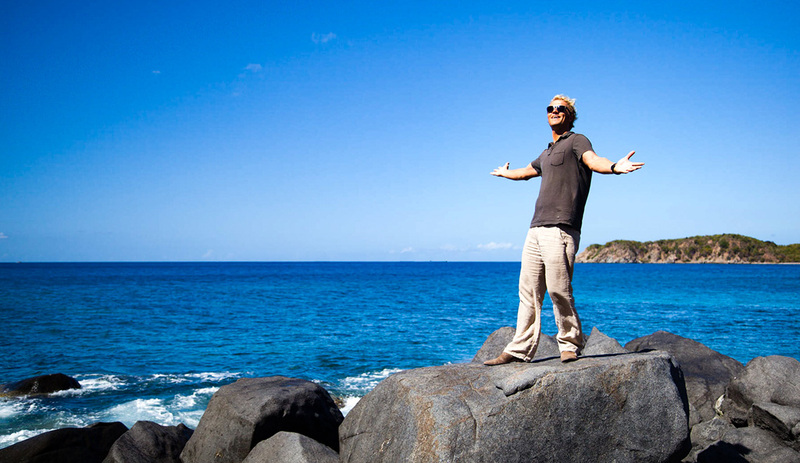 The Caribbean is paradise, but of course, with its own quirks and routines. Caribbean island life is not for everybody. That’s why you see many people return to their home countries within a short period of time. A small group of people truly love it though and stay. 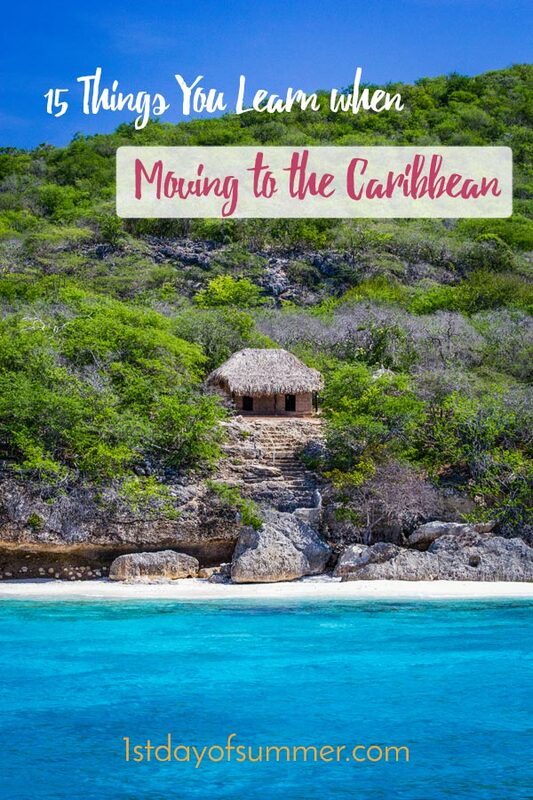 Both for people that live or lived somewhere in the Caribbean, this list of things you learn when moving to the Caribbean, will sound familiar. I can count the number of times I was late in my life on 2 hands. I was brought up that way and clearly those values were not taught in the Caribbean. No worries, I get the laid back island vibe, the heat that slows you down and the sometimes just plain ‘I really don’t feel like it’. I never was able to adjust to island time and I was still always right on time. I did figure out simple solutions to make waiting more bearable, like bringing entertainment wherever I go (iPad, magazine). In case other people visit you, just don’t think about it and start doing something else. And remember when frustration comes a knocking: “Don’t worry, be happy”. Remember back home, when spring hits, and everybody runs outside to the terraces and parks and enjoy a refreshing beverage? Yeah? Well, you feel like doing that every day in the Caribbean. Laid back vibes, Tourists all around you drinking like it’s their last cocktail of the year, perfect beach bars, cheap rum, everybody happy… the temptation becomes too much to handle. Alcohol consumption for new arrivals usually goes up 10 fold. And you become good at it too! Visiting friends will not be able to keep up with your new found skill. The first year is probably the most alcohol-filled as everything is new. The weekly volumes eventually go down, but in most countries you are still regarded a raging alcoholic. Islands in the Caribbean are small (except for islands the size of Puerto Rico and up). This means that there is less volume, and less volume means higher shipping costs. Often there are less favourable import duties and prepare for long, long waits at customs. Miami realised they are the one easy accessible destination to and from most of the Caribbean. So they built several outlet shopping malls (including many shops to buy suitcases). We know people who take a morning flight, shop their brains out, and take the evening flight back. All this is often still cheaper than buying it on-island. You have to work just as hard, if not even harder than anywhere else. 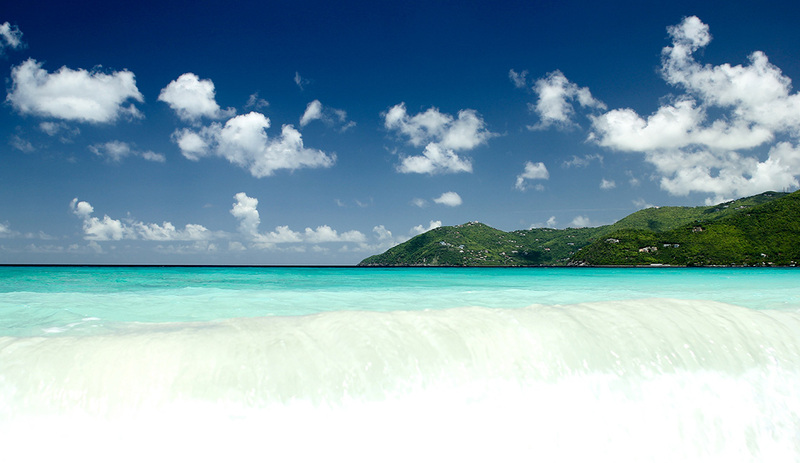 But… as soon as the clock hits 5 pm on a Friday, the Caribbean shows its best side. Happy hours all around, people on the streets drinking, no mention of work! Saturday and Sunday? It all gets a lot better; lazy beach days, beach parties, BBQ with friends, boat trips, sunset dinners, water sports, great weather, fishing. You name it. Everything you imagine a great summer vacation has to be like, it’s there for the taking every single weekend. Potholes, blazing sun, heavy rains and salt. I sometimes felt sorry for my car. When your car breaks down every couple of months, you pick up a few things. Like a battery only lasts about 1 and a half year in the Caribbean. But of course, you forget every time so you become a master in jump starting a car. You make sure your tire pressure is always just right (the PSI is on the tire) and you have enough grip to go up that steep, slippery hill. You change a flat tire faster than many professional pit crews. Several ‘car sounds’ become familiar and you know when you have to rush to the nearest garage. But not before you had your ‘car-guy’ take a look at it for a cheap, temporary fix. The car parts store becomes a regular stop and you know your exact car make, year and chassis number. Standard items in the back of your car: Spare tire, jack, duct tape, WD-40 and jumper cables. The last couple of years several bigger supermarkets popped up, which means you don’t have to drive to 5 different stores to get all the groceries you need. But that doesn’t mean they always have what you need, far from it. A lot of products are scarce (boats don’t come in, flights get delayed or they just forgot to order), and scarcity means higher prices. Much, higher, prices. Luckily, in most islands the prices for basic food groups are government regulated. Try to not focus too much on the pricing; if you can afford it, just buy it and enjoy it. You never know, it can take weeks before your favourite product hits the shelves again. You are close to the equator. This means that the sun generally comes up between 6 and 7 am and sets between 6 and 7 pm (depending on the time of year). I was born in the Netherlands where in the summer it could be light out until 10.30 pm. I missed those summer nights. I often fantasised about all the great things I would be doing in the Caribbean if we had a season like that (especially surfing till 10 pm). But, flip side: you don’t get those cold, short days where you go to work in the dark, and you leave work in the dark. No more winter depression! Yes, you do spend a lot of time on the beach or on the water. But you have to work just as hard, or even harder in the Caribbean. When on Skype (or FaceTime) on a weekday, you get questions like “How was the beach today?”, “What cocktails are you drinking?”. Really? It’s difficult explaining your Caribbean life to other people. But that makes the times when you actually are on the beach on a Wednesday sipping a Cuba Libre, extra sweet! Most people move to the Caribbean because of the weather. And rightfully so, if you love summer vibes and nights, the Caribbean climate nears perfection. Usually, the temperature is around 28 – 30 Celsius (82 – 86 degrees) during the day, about 25 at night and the water is about 28. Every day! So that means you can wear shorts every day and sweaters aren’t really necessary. It never gets crazy hot like Southern Europe with 40 degrees and the trade winds are a welcome friend. It’s not always great unfortunately: in September and October the wind disappears and it gets a lot sweatier. But overall, for me, the weather feels perfect. I didn’t miss the seasons at all (although we do have them) and I just loved that every night felt like a summer night. Island populations are extremely multicultural. People flocking from all over the world, but also neighbouring islands. And they all speak different languages: English, Spanish, Dutch, French and even Creole languages like Papiamento. You have to switch at any given time. Make sure you know the most basic phrases of each language. After a while, you know exactly who speaks what, which store is run by Venezuelans, which by Chinese and which by locals. Mixing it up becomes normal and sometimes it even gets hard to remember a specific word in your native language. The world’s most deadliest animal spreads all kinds of diseases. Especially in the Caribbean: dengue, chikungunya and who knows what variation pops up every year. And then there is all the itching and the buzzing keeping you up all night. Don’t leave puddles of water anywhere in your garden as within 3 days they will be swarming. One big winner in all this is the insect repellent company called ‘Off’ with its recognisable orange and green bottles. Wherever you go in the Caribbean, this is the #1 selling brand. Luckily, over time, you develop a natural ‘Off’. The best is when people come to visit, as they love fresh, new, non-Caribbean blood and leave you alone! Islands don’t have clothing trends. Every year it’s about the same. And understandable, what can you really change in a swimming short design, flip flops or a cute beach dress. You also wear a lot less. So no jackets, sweaters, you just don’t need them. That makes stepping out of the house a lot easier. Put on short, a shirt, and go out into the garden. Love it! When living in Europe or the US, you get used to cheap flights to other countries allowing you to go on weekend city trips. You would think the same goes for the Caribbean, but unfortunately, it is expensive to fly. Even traveling to a neighbouring island can set you back a couple of hundred bucks. Then there are the delays… Don’t expect anybody informing you about the cause of the delay. Just sit back, and wait and wait. Always make sure you have enough time between connecting flights. Unless you live in Sint Maarten (a hub) there are hardly direct flights to other islands. I once flew from Curacao to Barbados which took about 8 hours and landings on 5 islands. It’s actually faster and cheaper flying there from New York. Friends and family come to visit every once in a while. You get to spend quality time with them. Sun + beach + friends = the best time! But… they all leave again. Even though you see them more in one week than you would have seen them back home in a whole year, it is going to hurt. Luckily every goodbye gets a little bit ‘easier’ as you develop a thick skin. You kind of have to. I have seen the sun go down hundreds of times and every time it happens, I take a moment to enjoy it. 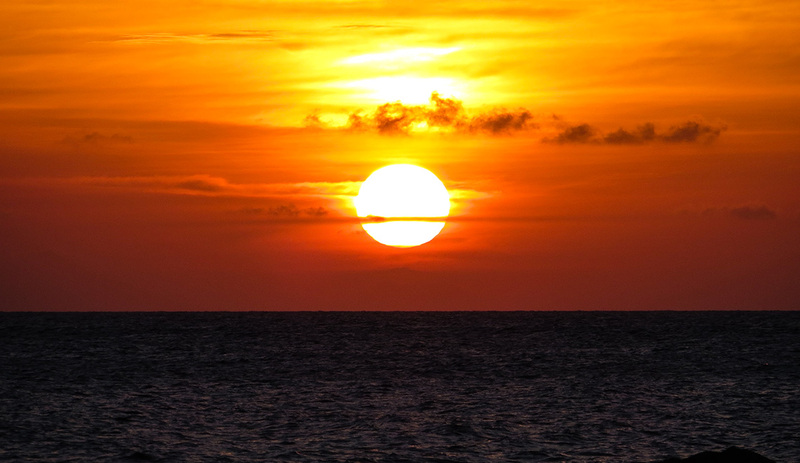 It’s a game to predict if the sun will hit the water or gets blocked by clouds or haze. I add the occasional ‘tsssss’ when the sun does hit the water. The best ones occur when the clouds are just right and there is moist in the air. The colours can be amazing with differed hues of blue, purple, orange and red. A sight for delighted eyes! Do you have anything to add to this list? Let me know in the comments.